No new plug-ins but an effects suite to considerably enhance your mixing and mastering capabilities. A good selection of plug-ins, to cover a wide range of needs. Maserati's VX1 makes vocals shine with a minimum of fuss. The bundle price is considerably cheaper than the combined cost of the individual plug-ins. Only that it's a bundle package, rather than a new product. Morgan Page, producer, DJ and remixer, together with Waves, has designed a toolbox aimed at electronic music production, with a group of nine plug-ins chosen for their versatility. "Whether you're looking for production enhancers, mix tools or mastering solutions, there should be plenty here"
Whether you're looking for production enhancers, mix tools or mastering solutions, there should be plenty here. Tony Maserati's VX1 comes first. It was designed to help blend a vocal to a production and includes three starting contours, which provide an acoustic space in which to work. Further parameters provide tone and dynamics controls, whilst delay and reverb effects are also included. It places a number of key vocal tools under one roof and is capable of great results, despite a seemingly limited parameter set. H-Delay is designed as a hybrid delay plug-in, capable of clean, digital delays and crunchy, pitch-wobbling tape-effect ones alike. A Lo-Fi option provides grit, and the Ping-Pong option creates a wider stereo delay image. Extra magic comes from the Modulation section, where an LFO is employed to produce pitch variation whilst the Filters section provides High and Low Passtone shapers. Mixing console emulation comes via the NLS Channel and NLS Buss. These emulate the sonic response of three classic hardware consoles ('Spike' Stent's SSL G Series, Mike Hedges' EMI TG12345 Mk 4 and Yoad Nevo's Neve 5116), with the Channel plug-in offering console-like signal colouration and routing into the Buss plug-in, which is designed to replicate the sound of those consoles' summing capabilities. TrueVerb is a great-sounding reverb plug-in equally designed for regular reverberant treatments and a second Thru mode, which provides room characteristics around a dry signal. This flexibility makes it a great multi-purpose reverb choice. Waves' Vocal Rider plug-ins enhance vocal performances further, either via the Live version, which looks ahead to keep vocal level on an even keel, or via the 'main' version which can be used to create a volume automation line to be edited further in post-production. The Soundshifter pitch-shifting effect is designed to provide alias-free pitch offsets in semitones or cents, whilst the H-EQ plug-in is a powerful multi-band EQ, which provides excellent input/ output analysis to help you tailor tonal tweaks at precise frequencies. 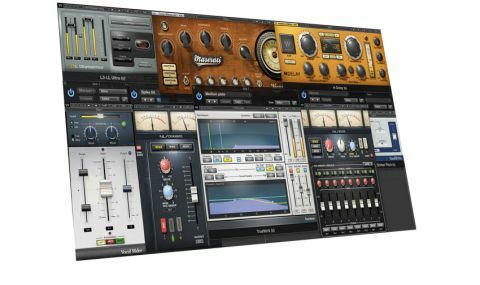 The bundle's reach stretches into mastering tools too, with the inclusion of two L3-LL processors: the stereo-band Ultra plug-in and the Multi-band equivalent. The first works primarily as a loudness maximizer, whilst the Multi version provides a frequency-sensitive approach to output limiting, breaking a signal down into five bands so each can be processed with individual maximizing settings, offering more complexity but a more tailored approach to the contours of your track. These aren't new plug-ins, but they are hand-picked as particularly suited to electronic dance music production. As the bundle sells for considerably less than buying them all individually, if you're short of a few quality mixing and mastering processors, this collection should pique your interest.